Bhiksuni Chueh Long is the network hub of Fo Guang Shan. She is the Grand Master of the organization. She designed & transformed Fo Guang Shan into a systematic & highly efficient organization. Bhiksuni Chueh Long is also a great Human Resource Developer, as many people are trained by her or the system she developed. In 1969, she became Buddhist novice under Master Venerable Hsing Yun. Later she received Bhiskhuni ordination at Keelung Hai Hui Temple 基隆海會寺. In 1974, she went to Kyoto, Japan Bukkyo University 日本京都佛教大學 to study social welfare & graduated. In 1998, the University of the West 西來大學 awarded her with an Honary Ph.D.
After her return from Japan she helped to establish Fo Guang Shan Social Work, such as the founding of the Great Mercy Children’s Home 大慈育幼院, Cloud Water Mobile Hospital 雲水醫院 & 友愛服務隊的濟貧賑災 You Ai Disaster Relief Group. After 20 years of social work she realized the need to package teaching Dharma into all Fo Guang Shan Social Work Activities. During her term as Abbess of Taipei Pumen Temple 普門寺, it was totally transformed into a Robust Urban Buddhist Pureland as she created different types of activities to suit different groups & interests . She formulated 中華佛光協會 Buddha‘s Light International Association Taiwan. It formed on 3 Feb 1991 at Taipei Sun Yat-sen Memorial Hall. It later grew into the Buddha's Light International Association. It was established on 16 May 1992 at Hsi Lai Temple, Los Angeles, California, USA. This organization later evolved into a Global Organization. 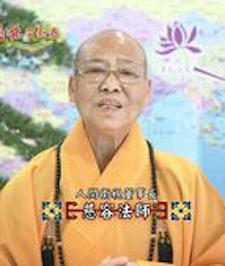 In 1996, Bhiksuni Chueh Long 慈容法師 went to Los Angeles, California to run Hsi Lai Temple. On July 22, 1996 she met US Vice-President Al Gore at Hsi Lai Temple. It was supposed to be a visit by US President Bill Clinton, but due to his busy schedule, Vice-President Al Gore came instead. She formed 佛光衛星電視臺 Buddha's Light Television, now known as 人間電視Beautiful Life Television. This TV station began its first broadcast on Dec 14, 1997. Under Bhiksuni Chueh Long’s 慈容法師 leadership Fo Guan Shan generated great resounding success with the Buddhist Chanting Musical Concert in 1979 at Taipei Sun Yat-sen Memorial Hall & the Buddhist Musical Great Prayer in 1990. From 1992 onwards, under her guidance, Fo Guan Shan annually performed 梵音樂舞 Buddhist Dance & Musicals at 台北國家音樂廳和國家戲劇院 National Chiang Kai Shek Cultural Center. From 1997 onwards 佛光山梵唄讚頌團 Fo Guan Shan Buddhist Musical Troupe performed around the world. Master Venerable Hsing Yun saw the potential of spreading dharma through the internet; thus, Bhiksuni Chueh Long 慈容法師 became the Founding Principal of the Fo Guang Shan Internet Buddhist Institute; it is now known as 人間大學網路教學平台 Fo Guan Shan Open University. Since the opening of Fo Guang Shan Buddha Memorial Center 佛光山佛陀紀念館 in 2011, it has quickly become the Taiwanese Buddhist Landmark, the Glory of Taiwan & a World Buddhist Pilgrimage Destination. Bhiksuni Chueh Long is its Curator, in charge its planning & management.